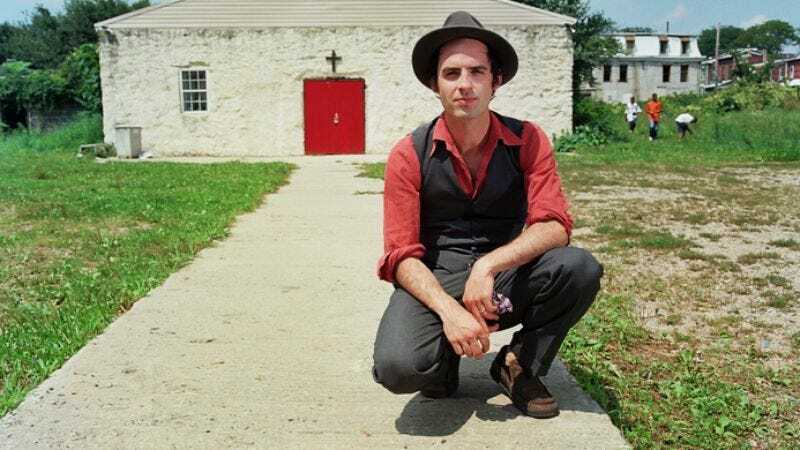 Don’t let the fact that his name-making band is on hiatus fool you: Clap Your Hands Say Yeah frontman Alec Ounsworth is a busy man. Ounsworth put out two records in 2009: the jagged Skin And Bones (self-released under the pseudonym Flashy Python, and featuring members of Man Man, The Walkmen, and Dr. Dog) and the looser Mo Beauty for Anti-, recorded in New Orleans by veteran producer and Los Lobos saxophonist Steve Berlin, and featuring funk and jazz heavy hitters like The Meters’ George Porter Jr. and Stanton Moore of Galactic. As Ounsworth prepares to tour his new material—including a Jan. 28 show at Music Hall Of Williamsburg and Jan. 29 at Terminal 5, both with Cold War Kids—The A.V. Club talked to him about the relative importance of names and the similarity between music and painting. The A.V. Club: What has it been like working with all-new collaborators? Alec Ounsworth: It was similar for the two projects, except that [for Mo Beauty] I had these guys for a certain amount of time, and they were fully concentrated. Flashy Python was pulling everybody in when they were available. But in New Orleans, it was pretty nice. These are guys who can move around a lot more than most musicians I’ve played with. They have their own thing happening, but I can ask them to do five variations on one thing and they can come up with something distinct. It was sort of an experiment to see what it would be like playing with people like this. It’s not anything I was accustomed to doing or that I so readily would have done if Steve [Berlin] hadn’t asked me. AVC: Was there a moment during the experiment when you thought, “This is going to be all right”? AO: [Laughs.] Maybe toward the end. I never think everything’s going to be all right. It was only 10 days that we were down there; I just had to push on through. Flashy Python was a marathon—this was a sprint. Steve was used to making this type of record, and I was not. I don’t know how quickly I would do a 10-day record again. It was pretty grueling and intense. AVC: Why work as Flashy Python? Why not just release Skin And Bones under your name? AO: I just felt that it should be called by something other than my name—or maybe my name didn’t seem exciting enough at the time. I wanted to use that name for something. It’s a name I took from my father. He was in the Navy back in the Gulf of Tonkin, and he and his Navy buddies listened to call signs on the radio for other ships. One of the signs was “Flashy Python.” I go around stealing names, but at the end of the day it feels like names are like numbers that you’re assigned on a team. It really has nothing to do with the number. It’s who wears it. AVC: Do you feel that way about song titles? AO: I put a little more thought into song titles, because I think they’re more direct. It’s hard to qualify an entire project, and that’s why it seems relatively arbitrary. But for songs, you imagine that you’re specifically trying to represent something to a degree. AVC: So is there a specific Pieter Bruegel painting you had in mind for “That Is Not My Home (After Bruegel)”? AO: Oh yeah, [Landscape With] The Fall Of Icarus, where the farmer’s out in the field and he’s falling, and the farmer doesn’t notice, I felt like that related to the song. You can determine how yourself—I would rather not explain away why I think it relates. The best stuff I’ve heard doesn’t point out what the writer is talking about. It’s more like a painting than anything else. That’s music. AVC: Your touring band comprises three-fourths of Philadelphia’s The Teeth. Do you expect a group of twenty- and thirty-something Philadelphia pop-rockers to play like veteran New Orleans jazz and funk musicians? AO: [Laughs.] I don’t even expect myself to be like I was when I was making that record. That’s why it’s so interesting to see Bob Dylan and people like that go out and do their songs over and over again, because everything switches up all the time, whether or not the musician himself knows it. If you’re coming to the shows, it’s not going to be precisely the way it was on the record. Honestly, I don’t really care for that. You can go home and listen to the record.